Barefoot with Champagne: Life Lately Mash Up! We celebrated our friend Michael's birthday! 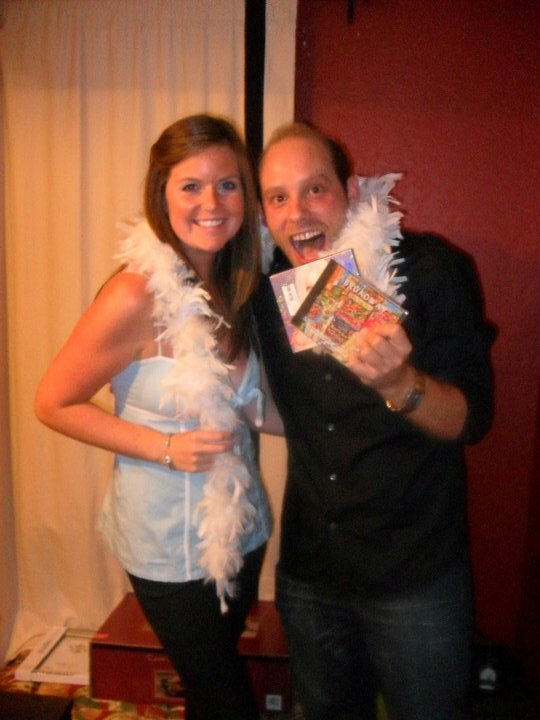 I got him The Best of Show tunes and Cher's greatest hits cds! 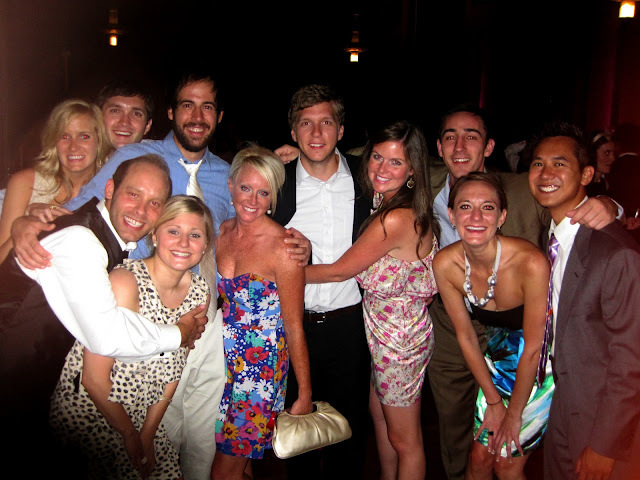 We went out with some Dental School kids and ran into some non-dental school friends! It was hotttttt out. This was August ok people... I'm REALLY behind. 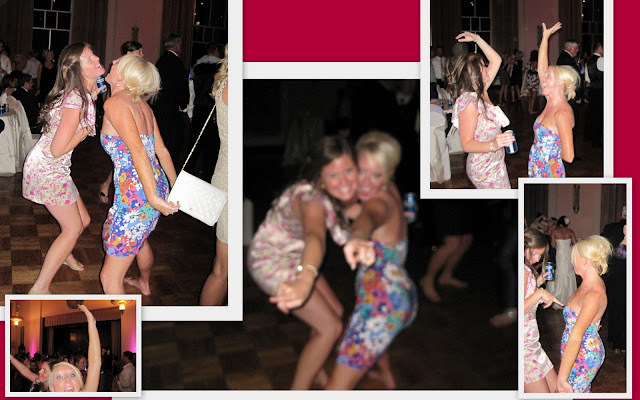 We attended a couple of weddings, and had a blast! As always..there was lots of dancing! This was at Audra and Ryan's Wedding downtown at the Hall of Mirrors! Ugh I want to be this tan again! There must have been a Journey song on.... or Lady Gaga, or Sweet Home Alabama or Friends in Low Places... Who am I kidding? This just happens to me at fun weddings! And we managed to get a good group photo at the end of the reception! I was so surprised when I saw how cute this was, given the amount of dancing that had been done that night. Now onto the afffffter party! Morning after brunch with the same group from the group shot! Yikes... I won't make this one too big! haha! Sorry friends! We enjoyed some dinner on the rooftop patio at El Guapo's in Tulsa with the rents! We had Dave's family over for dinner and used our dining table for dining for the first time! I was pretty psyched for this corn dog, It sucked. I only ate about half of it. Big let down. Dave had cheese on a stick, he looks forward to this every year. As soon as we enter the fair facilities, he's on a mission to find the cheese on a stick stand. Oooh boy! We found it! High-fiving MC Hammer + Cheese on a stick stand discovery = One happy Dave! Onto the next wedding! This was Kara And Paul's gorgeous wedding! The reception was at Will Rogers and was b-e-a-utiful! My wedding dance partner Ashley with the bride and groom in the background! Dave's favorite way to take pictures... pre-posed. Happy after an OU victory over Cincinnati! What? Definitely too much wine.. This was the best we could do... oh well. Finally got a picture with the bride at the after party! Phew... I hope you guys enjoyed that! I had to download Firefox in order to get the picture thing working... whatever Blogger. You win. You always do. So fun! Don't you just have a love/hate thing with blogger? I have had to start uploading my pics to snapfish and then just using the link because it took FOREVER to upload pics. I also hate how it adds them in reverse order. Se la vie :)!